With a recent 63rd consecutive launch success, the European launcher Ariane 5 has a leader position on the commercial launchers market. In order to ensure this leading position, ESA’s member governments met in Luxembourg in December 2014 and agreed on Ariane 5’s next evolution, While Germany was in favor of a progressive upgrade of the current Ariane 5 version (Ariane 5 ECA becoming Ariane 5 ME), France supported the development of a new Ariane 6 version. Ministers of ESA Member States eventually chose the French proposal. Ariane 6 is expected in 2020. Ariane 5 G (Generic) is the first version of the launcher and flew 16 times between 1996 and 2003 with one failure and two partial failures. It had a payload capability to GTO of 6.9 t for a single payload and 6.1 t for a dual launch. An enhanced version, called Ariane 5 G+ (Generic +), had an improved second stage and a GTO capacity of 7.1 t for a single satellite and 6.3 t for two payloads. This improved version flew 3 times in 2004, with no failures. A third version, Ariane 5 GS, flew 6 times between 2005 and 2009, with no failures. Ariane 5 GS was built after Ariane 5 ECA’s first flight failure in 2002, and replaced the ECA launcher version during investigations. Ariane 5 GS was built based on an Ariane 5 ECA with core modifications. An increased mass due to these modifications resulted in a reduced payload capacity to GTO: 6.6 t for single launches and 5.8 t for dual launches. Ariane 5 ECA (Evolution Cryotechnique type A) is the fourth and current version of Ariane 5. It was first successfully flown in 2005. It is powered with an improved Vulcain II engine for the first stage while the second stage uses a Cryogenic Upper Stage. In addition, the weight of the boosters has been reduced. These features allow Ariane 5 ECA to have a GTO launch capability of 9.6 t for a single satellite and 9.1 t for two payloads. A fifth version of the launcher, Ariane 5 ES (Evolution Storable) has a LEO launch capability of 21 t and has already been used five times since 2008 to put ATVs in circular orbit, at an altitude of 260 km. All five Ariane 5 versions (Ariane 5 G, G+, GS, ECA and ES) are based on three main elements: a Cryotechnic Main Stage (in French EPC for Etage Principal Cryotechnique), Solid Rocket Boosters (EAP for Etages d’Accélération à Poudre), and a second stage which is either a Storable Propellant Stage (EPS for Etage à Propergols Stockable) or a Cryogenic Upper Stage (ESC for Etage Supérieur Cryogénique). Depending on the launcher version considered, the stages and the boosters come in normal or improved versions, allowing more thrust and therefore a higher payload capability. The Cryotechnic Main Stage is a 30-meter-high tank powered by a Vulcain II engine delivering a thrust of around 1.4 kN. This main stage weighs around 190 t including 175 t of Liquid oxygen (LOX) and liquid hydrogen (LH2) propellant. At lift-off and during the first phase of the flight, two Solid Rocket Boosters added to the sides of the Cryotechnic Main Stage deliver each around 7.1 kN of thrust for 277 t of wet mass. They help accelerate the launcher before separating and falling in the Atlantic Ocean. The boosters generally sink to the bottom of the ocean, although they have been recovered occasionally for post-flight analysis. Regarding the second stage, the Storable Propellant Stage uses hydrazine and nitrogen tetroxide while the Cryogenic Upper Stage is fueled by LOX and LH2. The Storable Propellant Stage can be reignited multiple times, a capability used for the first time in March 2008 during the deployment of the first ATV. Artist’s view of the Ariane 6 four boosters configuration (A64). – Credits: ESA. In November 2012, ESA’s Ministerial Council secured the development of the sixth version of Ariane 5: Ariane 5 ME (Midlife Evolution), a higher performance and more versatile version which should have replaced both Ariane 5 ECA and Ariane 5 ES. 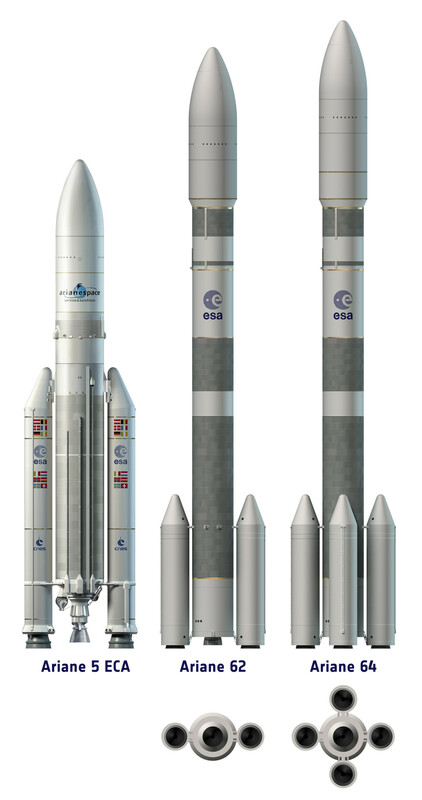 Backed by Germany, Ariane 5 ME was supposed to have the same lower composition as the one used currently on Ariane 5 ECA (i.e. two solid rocket boosters and a cryogenic main stage with the Vulcain II engine), and a new cryogenic upper stage powered by the under-development re-ignitable Vinci engine. The aim was to be able to launch larger and heavier satellites on various orbits: LEO, MEO, GTO, high-perigee geostationary orbit GTO+, and even Earth-escape for interplanetary missions. Ariane 5 ME’s payload capability to GTO was announced to be 12 t for dual payloads and a maiden flight was planned for 2018. After a long wrangle between Germany and France over the future of the European launcher, the Ariane 5 ME upgrade was cancelled in December 2014 since it lacked support from France, one of the two major powers behind the launcher. Germany had supported ME as a quicker, lower risk option to fend off rising new competitors such as SpaceX. But a new Ariane 6 proposal put forth by Airbus Defence and Space and Safran finally won Germany’s backing, even two years into ME’s development. Artist’s view of Ariane 5 ECA and the two configurations of Ariane 6 using two boosters (A62) or four boosters (A64). – Credits: ESA. Meeting in Luxembourg on 2 December 2014, ESA’s member governments decided that they will not fund two different projects and agreed to proceed directly to the development of Ariane 6. 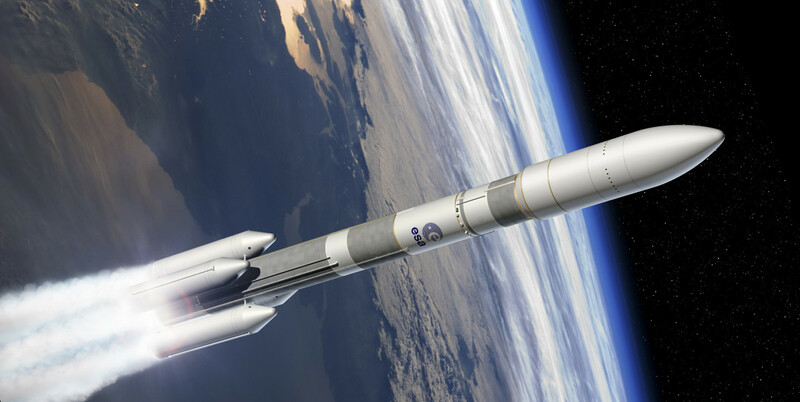 According to the president of the French space agency (CNES), Jean-Yves Le Gall, the new launcher would be available in a light version, Ariane 6-2, with two P120 solid rocket boosters for a cost of around 70 million euros per launch. The heavy version Ariane 6-4 will carry four boosters and will cost around 115 million euros per launch. Both light and heavy versions would come with a main stage powered by a Vulcain 2 liquid engine and an upper stage powered by the new Vinci engine. The launchers would target GTO, with a single payload launch capability up to 5 t for Ariane 6-2, or two payloads up to 11 t for Ariane 6-4. Le Gall said Ariane 6 could be ready for a maiden flight in 2020. ESA will give industry the responsibility for developing and manufacturing the new launcher. A joint venture co-owned by Airbus Defence and Space and Safran will be created for this purpose. ESA will fund the development of the rocket and will guarantee five government launches per year while industrials will be responsible for finding six more launches. The purpose of this arrangement is to end the subsidies that European governments pay to Arianespace yearly to help the company avoid financial losses. Free to decide their own industrial and institutional organization since they do no rely on European subsidies, Airbus DS and Safran will lower recurring costs with a simpler production process. However, development costs and the building of a new Ariane 6 launch pad at the Guiana Space Center in Kourou will increase the whole bill: 4 billion euros for the launch pad and around the same amount for the same costs for the new rocket. Bringing together 8,000 employees, Airbus DS and Safran will give birth to the world biggest company in the space sector.